Between 1994 and 1996, music writer Paolo Hewitt spent the greater part of his life on the road with Oasis, in the U.K., Europe and America. He came back with tales that would cement the legend of the brawling, effing, hedonistic, charismatic, confessional and extraordinarily talented Gallagher brothers, Noel and Liam, and their group. Hewitt is a rare and perceptive fly-on-the-wall during the band’s hectic rise to the height of their powers, as their first two albums are released to the kind of excitement scarcely seen in British rock music since the sixties. 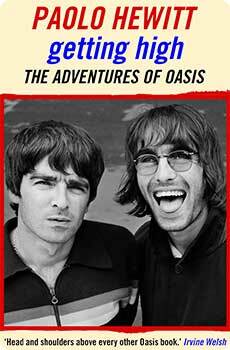 Hewitt takes the Gallaghers’ story right back to their parents’ roots in Ireland, and the descriptions of Noel and Liam’s childhoods in working-class Manchester reveal the seeds of their determination to make Oasis the force it became. Getting High is an illuminating, funny, sometimes shocking reminder of how big a band can get, and how quickly the insanity sets in. Oasis have today sold in excess of 70 million records worldwide. Hewitt's intimate account of this explosive and beloved band, in their prime, is a rock classic and a riveting narrative.